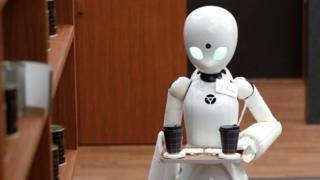 The OriHime-D robots used in the cafe were developed by Japanese start-up Ory and were originally created to be used in the homes of people with disabilities that severely restrict their movement. The robots can be told to move, observe, talk to customers and carry objects, even if their operator can only move their eyes. These abilities have been adapted for use in the cafe. The pilot scheme aims to test connections between disabled people and the robots, to help people who might otherwise be housebound earn a wage and interact with other people more easily. The human controllers involved patients with a variety of conditions including spinal cord injuries and the progressive neurodegenerative disease ALS (amyotrophic lateral sclerosis). The cafe will initially only be open for two weeks. Its creators are raising money via a crowdfunding campaign to see if they can get enough to open a Dawn Ver cafe permanently from 2020.